And this 'Saturday' finished up with Noel Gallagher on stage for 'Still Haven't Found' and 'All You Need Is Love'. Some great reviews coming in for the arrival of #U2IE in the UK. 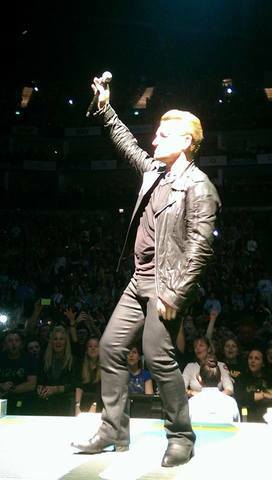 'This show showed that U2's mojo is back, and perhaps stronger than ever.' said James Hall in The Daily Telegraph. 'Even in minimalist (for them), stripped-down mode,' wrote Ian Gittins in The Guardian, 'U2's defiantly ambitious, meticulously choreographed live productions put virtually every other rock band to shame. More coming up on night two at the O2 but if you were there, tell us what it was like and post your photos below. 26 October 2015 O2 Arena Walking from the car park the sense of a near full moon was imminent in the evening sky. On finding my seat, a side on view of the stage parallel to the singer’s walkway in row P which was surprisingly close to the stage which resembled a mini runway with its yellow markings. As the house lights dimmed too Patti Smith’s, People Have The Power over the air waves the band materialised and the transition to The Miracle (Of Joey Ramone) with accompanied leather jackets worn by the band. Then whisked off to another time as Out Of Control blasted the perception, followed by the countdown to Vertigo and then to another place as I Will Follow completed the up tempo quartet of songs. The bands interactive screens are a blaze and shines like stars in the winter light along with family members in reminiscence to Iris (Hold Me Close). On climbing the ladder in too the screens walkway Bono takes a stroll along an animated Cedarwood Road as images pass on by, which will then blend into a Song For Someone, all glancing back within and without one’s self? A stripped back and slowed pace of Sunday Bloody Sunday is distinguished which then leads into Raised By Wolves with accompanying imagery and representations. Drinking the wine, breaking the bread for Until The End Of The World with further images of an open swirling continuous sea in motion. The Berlin wall moved in on the hanging screens as a remixed electronic version of The Fly buzzes around the arena. The band are between the images of the wall on the walkway, which slowly pixelates, breaks up and disperses as the song Invisible starts to take shape. On the E stage the band prepares for a jazzy and funky version of She Moves In Mysterious Ways while an acoustic Desire and Angel Of Harlem are sublime. A mellow light level ensues and a piano materialises for a beautiful sounding Every Breaking Wave with a blissful and effortless progression into October. Bullet The Blue Sky awakens while a superb transition to Zooropa then Where The Streets Have No Name is remarkable. Pride In The Name Of Love changing to the intimate With Or Without You is also incomparable. The encore of City Of Blinding Lights and the static of Beautiful Day came to a close with an excellent I Still Have Not Found What I am Looking For. In one word the show was transcendental. Amazing night and awesome performance by the band. It felt so full of energy and the lads seemed to be enjoying it as much as us. My daughter loved it said it was amazing, it was the first time she'd seen U2. Nice to see Noel up there at the end. Let's hope this isn't a swansong tour. My wife Tracey and I were there last night for my 30th u2 concert,we went on the experience bus which was unbelievable but the best thing ever happened to us as we met Adam and the edge,the show itself was just amazing and helped cap of a perfect weekend of memories to take back to Barnsley with us that we will never forget. You tend to spot the differences when you go to two nights on the trot. Different selection from Boy. Two brothers playing guitar on the 'e' stage. Swopping coats with a punter after getting him onstage to sing. Noel Gallagher arriving right at the end and riffing with Bono on the Beatles. Immensely innovative stage show coupled with characteristic U2 honesty and integrity. #welcome refugees indeed. Raising the bar - while hitting in the gut. Unbeatable combination. 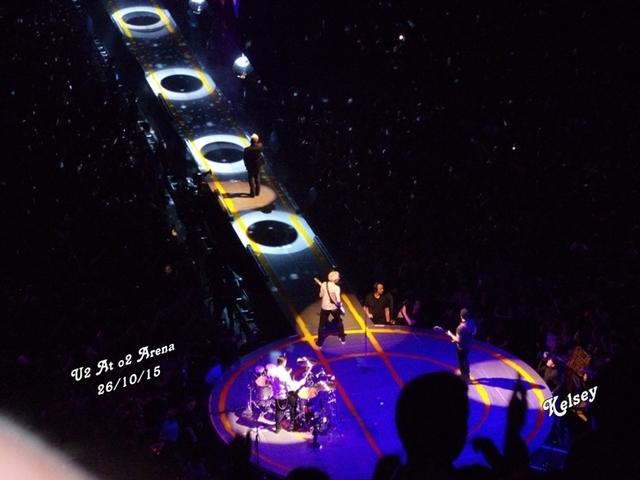 U2 Thank you for fantastic night night at O2 Arena 26/10/15 you were outstanding. I spend my birthday night out in company of U2! And I loved it! I have 't seen them on stage since 2005, in Holland! Ten years have passed and the energy and the feeling is the same: they always touch my soul. Innovative, inspiring. I loved the version of "Until the end of the world" and the young Bono writing songs in his bedroom. Amazing. Thanks U2 for my party! u2 have made a perfect gig. they have taken it to another level and made it an all encompassing amazing experience. do i have to go back to the ordinary world now?